It’s been quite some time since Puck Junk’s last installment of “The Lost Cards,” where we investigate the fate of hockey cards that should have been but never were. 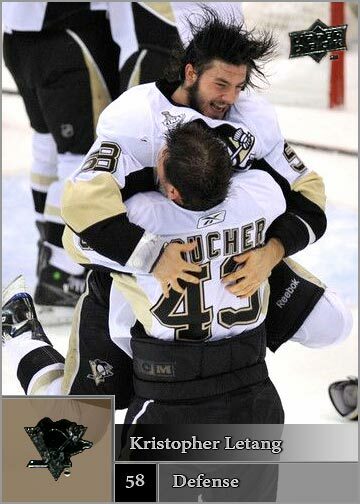 Today’s “no card” is of Pittsburgh Penguins defenseman Kris Letang. 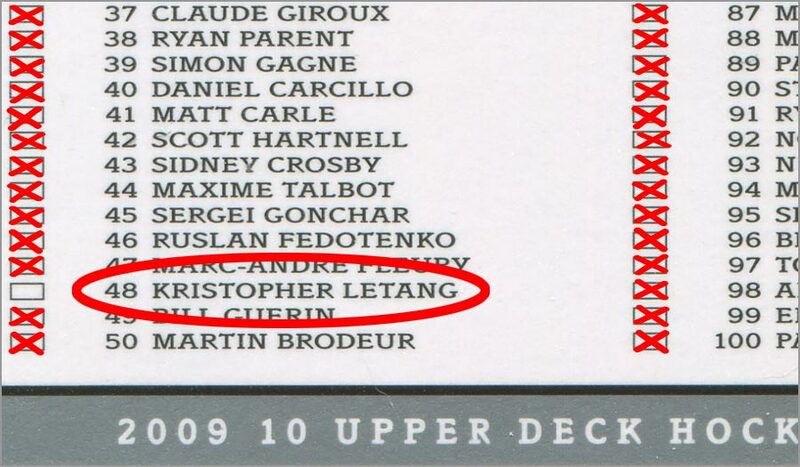 The checklist for the 2009-10 Upper Deck Series One Hockey set lists card number 48 as Kristopher Letang, back when it was still cool to have a three-syllable name. However, Letang actually is not in the set. 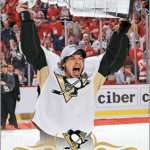 Instead, card number 48 is of Letang’s teammate, Evgeni Malkin, shown shortly after he won the Conn Smythe Trophy as the 2009 playoff MVP. Here, the checklist states that card 48 is Kristopher Letang. Four months later, when 2009-10 Upper Deck Series Two came out, you would think Letang would be in that set. He was one of the Penguins’ main defenseman during the 2008-09 season, and even scored four points (one goal, three assists) in the Stanley Cup Finals. But nope. Instead, Malkin got a second base card in the set. Malkin also has a card in Series Two. No one knows why. 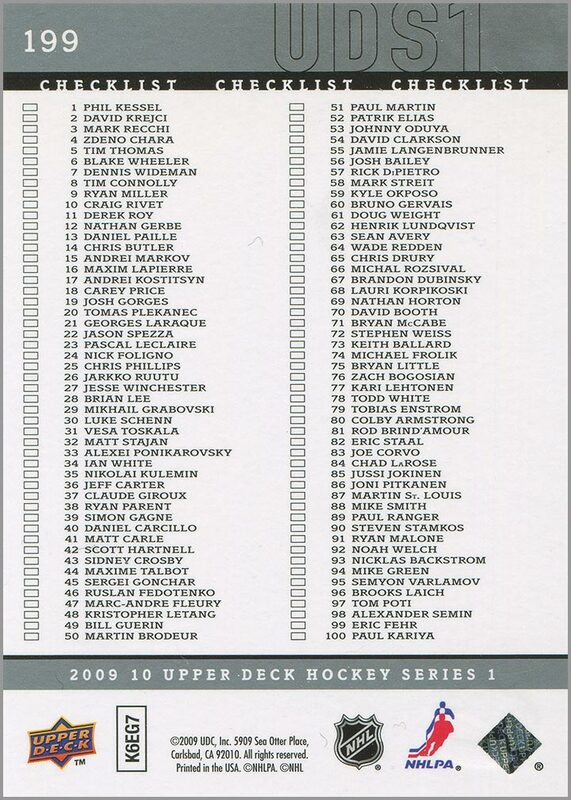 The checklists for Upper Deck Series Two list card 293 as Malkin, so it seems likely that he was always intended to be a part of Series Two. Perhaps someone at Upper Deck back in 2009 thought it would be better to put Malkin — who was the playoff MVP, after all — in Series One, and Letang’s card got yanked to make room for him. Only, they didn’t bother to remove Malkin from Series Two. 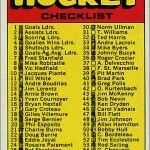 If you count that Malkin is also pictured on a checklist card (#449), he appears three times in the 400-card base set. Letang didn’t make the cut in 2009-10 Upper Deck, though he does appear in other sets. Still, I thought it would be fun to make a custom of what Letang’s card could have looked like if he was included in the 2009-10 Upper Deck set.